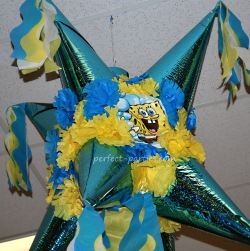 SpongeBob Party Ideas for kids. There is a huge selection of party supplies and party packs. This is a very popular theme with children. SpongeBob Party Pack from Celebrate Express make getting supplies a cinch. Sponge Bob Kit-N-Kaboodlekit from Shindigz. Yellow or white tablecloth. White will show off colorful decorations nicely. Bubbles- Gymborree has great bubbles. Or any bubble in a bottle and you can change the wrapper. Hamburgers: I saw them called Krabby Patties! Purchase SpongeBob stickers or print out pictures, laminate and decorate two plastic buckets and play Sponge Squeeze. See full directions by clicking on link provided.